The fresh flowers of zucchini dipped in a light, airy batter and fried until crisp and golden make a fantastic treat. 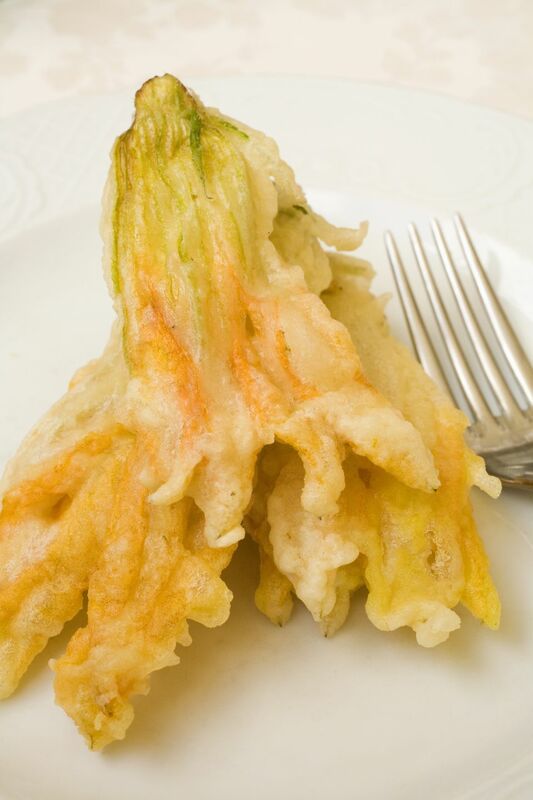 You can optionally fill each blossom with fresh ricotta (Tuscan style) or mozzarella and anchovy (Roman style) or even feta and mint (Greek style) before dipping in the batter and frying, but if you prepare them plain you can really taste the delicate zucchini flavor of the flower itself. If you can't find the flowers, you can use the same batter to coat and fry thin slices or strips of zucchini, or you can also dip and fry fresh sage leaves in the same way; fried sage leaves and zucchini blossoms are often served together in Tuscany. Remove the stem (if male), the pistils (if female) or stamen (if male) inside of each flower (both male and female zucchini flowers are edible, they just have different parts! Female blossoms are attached to the fruit -- i.e., a zucchini, while male blossoms are attached to a stem), and the prickly sepals around the bottom of each blossom (both male and female). You can slice the flower off of the squash or stem with a sharp paring knife, and you should be able to just snap the other parts (sepals and pistils or stamen) off with your fingers. Separate the eggs, keeping both eggs and yolks. Set the whites aside for now and in a large mixing bowl, lightly beat the yolks. Stir in the sparkling water, then slowly whisk in the flour, salt, and nutmeg. Then beat the whites with an electric hand mixer until they form soft peaks. Gently fold the egg whites into the batter mixture. Dip a finger into the batter to check its thickness: it should just lightly coat your fingertip. If too thick, you can thin it with a bit more sparkling water. If too thin, you can whisk in a little more flour. Heat the frying oil in a large, heavy-bottomed pot or skillet (use enough oil that the flowers will not touch the bottom of the pan or pot when frying). When the oil is hot, dip each flower into the batter mixture, gently letting any excess batter drip off, and then fry, turning gently, until light golden brown. Fry in batches and be careful not to crowd the pan, so that they will cook evenly and not lower the temperature of the frying oil. Drain briefly on a paper-towel lined platter or tray, sprinkle with salt and serve immediately, while still hot and crisp.